The holidays are right around the corner and with all the merriment and excitement in the air, one almost forgets one annoying little detail about the season: it's winter! With winter comes cold temperatures and hot furnaces. It also means dry skin and cracked hands and feet. 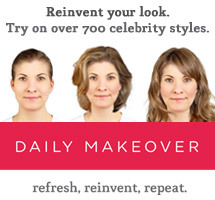 Luckily, the holiday cheer distracts from these perpetual discomforts as does a few key skin solutions. I'm incapable of functioning in the winter without lathering myself with the most moisture-drenching lotion I can find. It's a fact. My body converts into a cave of moisture and I try desperately to store and retain what's left. Ok, I'm bordering on dramatic but I seriously make sure I'm using the most potent skin care products I can find. For me, Eucerin always does the trick. The drugstore brand is a favorite among dry-skin victims. It's supremely moisturizing but doesn't leave a gunky residue and doesn't dry your skin out as some alcohol-based lotions tend to do. 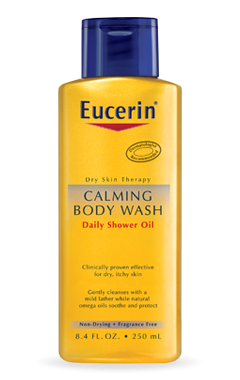 Eucerin Calming Body Wash: A nourishing wash that provides a soap-free cleansing wash and includes soothing omega oils. 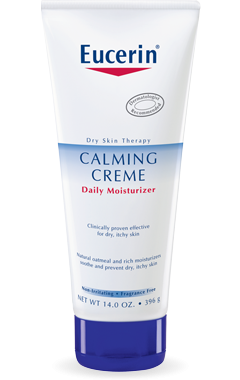 Eucerin Calming Creme: A non-greasy formula that effectively treats dry, itchy skin. This creme uses natural oatmeal to calm and protect your pores. I love how long the moisturizer lasts on the skin and how smooth the skin feels even after a full day of wear. This is also great to use if you have eczema. 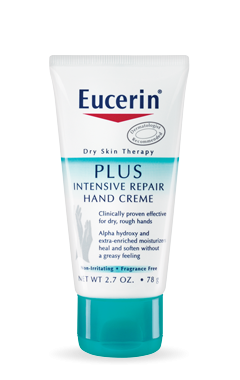 Eucerin Intensive Repair Hand Creme: I always carry a tube of this in my bag and use it to relieve the tight feeling my skin has after washing my hands. It's non-greasy and (as the name would suggest) intensively moisturizing. The formula uses alpha hydroxy to exfoliate the skin which helps your skin look smooth and plump after use. It is best to use this lotion with a sunscreen as people can have sensitivity to the sun and can sunburn since it has alpha hydroxy acid in it. This hand creme is especially amazing to use if your hands and fingers are cracking. 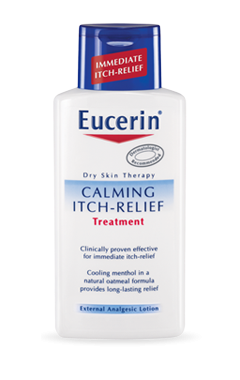 Eucerin Calming Itch-Relief Treatment: This lotion is fantastic to relieve itchy skin. It contains a cooling menthol that provides long-lasting relief. I love using this stuff after a long day outside (especially skiing) when my skin has faced the elements over an extended period of time and needs cooling moisture. 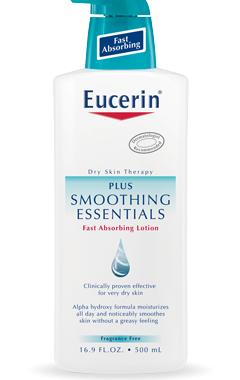 Eucerin Smoothing Essentials: This bottle of lotion is the key element for getting me through moisture-less winters. It's supremely effective, fast absorbing and non-greasy. It really is a winter life-saver. It also contains alpha hydroxy acid which will help gently exfoliate the skin but will make it more sensitive to the sun. I always mix my moisturizer with sunscreen to help lather it all on. I'd be lost without these products but luckily I keep them close and handy. That way my mind is rarely on my dry skin and 100% focused on the fun and festive season in front of me!